Is It Possible to Be Too Picky about Food? Were you an Auntie that may have experienced bullying when you were a kid. Or were you a bully yourself? If you weren’t one or the other, it’s likely you were a “bystander,” a witness to a bully or group of bullies. It might have been safer to just stay quiet to avoid unwanted attention. If you have siblings, it’s pretty much a guarantee you fit in one of the three roles – and probably switched around a bit, too. So let’s assume your nieces and nephews are vying between being an angel and devil or take on role of diplomat. Since you’ve been there already, you can assert yourself by sharing your own stories of growing up and see if your nieces or nephews can relate. Especially for your nieces, having you as a role model and confid-aunt, can go a long way in helping them deal with girl drama. Since it’s bully awareness week in some corners of the world (Nov 18-22), it’s a good time to think about your role as Auntie. Let’s face it. The anti-bullying campaigns in schools don’t always translate into real life. In fact, I hear middle and high school kids say that they are sick of all the bullying awareness assemblies or initiatives. Like, they get it already. Much of the bullying we experienced growing up happened more or less in the schoolyard, hallways, school buses or neighborhoods. We now we have the Internet and social networks. The culture of aggression among kids is more hidden than ever. There’s a whole new way for kids to vie for power in the social hierarchy. Not only can a bully enlist others, there is now room for many bystanders. With hundreds of followers on tweens’ and teens’ social networks, the sheer volume of potential witnesses to posts of overt exclusion and bullying is huge. One could have hundreds of friends and yet all could remain silent. Talk about lonely. At the same time, it would be heartening (if not radical) if just one of those followers interrupted the cycle. Took the higher road. Stood up and stood out. Who might be brave enough to “direct message” or text or call the girl or boy exerting malicious power? “Hey, that’s not nice. Friends support friends. If you have something to talk over, do it in person.” Or reach out to the slighted friend. “It’s okay, I’m your friend. Don’t let them get to you.” That’s a show of a decent friend and of emerging leadership. You can talk this through with your nieces and nephews. Play out some scenes together. There are other ways to show resistance, too. I recall a local story, just about a year ago, of a high school girl named Masie Miller. Some “popular” girls taunted her at school for having her hair in pigtails. She was an athlete and this was one method for keeping her hair out of her eyes. Apparently, Masie had been teased before (she did not share this with her parents). This time was the last straw. In a bold stand of resistance she created a Facebook page, Pigtails 4 Peace. Within days, other kids, teachers, and even a teacher’s dog were donning pigtails. The bullying stopped. It’s worth sharing these stories with your nieces and nephews. Kids need real life examples. Leadership and resistance is what’s needed and it doesn’t take much…just a dose of courage, kindness, and an understanding that we are all connected. Some audacious teens started an initiative called The Great American No Bull Challenge to encourage kindness by creating videos. The challenge was inspired after several teen suicides were thought to be related to cyberbullying. Here’s something for next time you hang with your nieces and nephews: Watch the 2013 finalist videos together. The more timely such messages are to a relevant situation in their lives, the better. The Great American NO BULL Challenge is a social action organization that offers youth the opportunity to promote digital responsibility, leadership and social change using creativity, the power of peer-to-peer education and the magic of filmmaking. NO BULL's Teen Video Award celebrates and promotes all those involved who brave the Challenge and stand up for change for the most important issues of our time. Dr. Tara Cousineau is a clinical psychologist, mother, and Aunt. She is founder of BodiMojo.com for teenagers, a health engagement platform for teens leveraging web and mobile technologies to inspire healthy living. 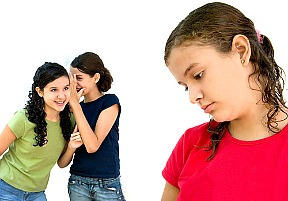 The use of BodiMojo.com by teen girls has shown to have a significant effect on improving girls’ attitudes about their own body image. Tara also blogs at BodiMojo.com/blog and TeensInBalance.com.